Well I'm back after a great break and what a good way to start back at the blog than with a terrific giveaway. 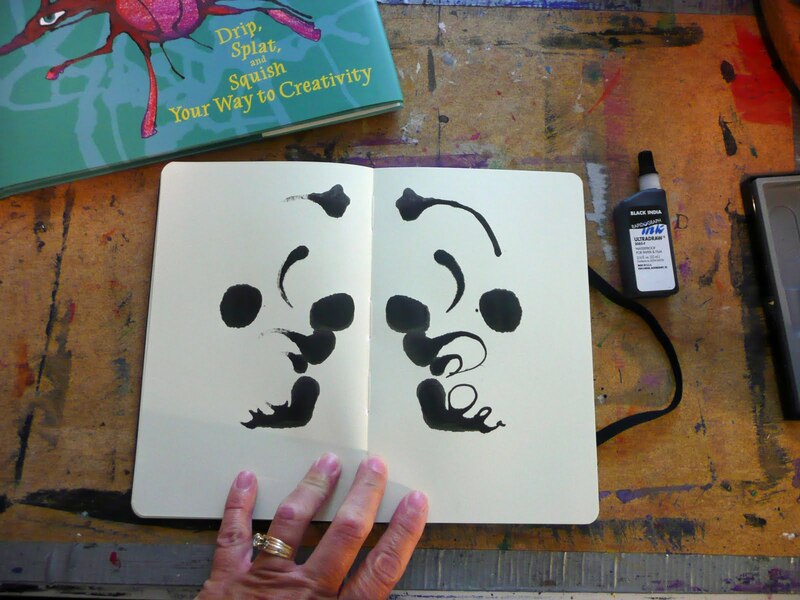 This is Margaret Peot's new book "Inkblot.....Drip, Splat, and Squish your way to Creativity"
I have used Margaret's previous book "Make your Mark" before in my lessons so I couldn't wait to see what she has come up with now! I used a sketchbook that I had on hand, applied some ink to one page and then folded over the former page page. I did find the ink bled thru to the underlying page so I would advise you stuff a wax paper sheet on either side of the 2 pages you are working on. 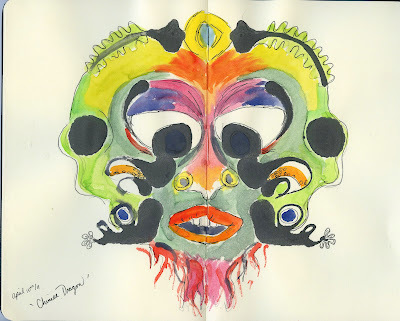 When I looked at my blot I could see a Chinese Dragon puppet head. It's amazing how one inkblot sketch will get that creativity flowing.........I started looking at all my dragon head reference photos and started making notes for new projects! 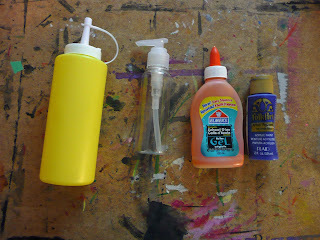 or use an eyedropper with either disk or liquid tempera. If using disk tempera you need to get your paint going so you have a pool of it from which you can draw up into the eyedropper. Open and leave your blot to dry. Once dry you can add eyes and extra details. 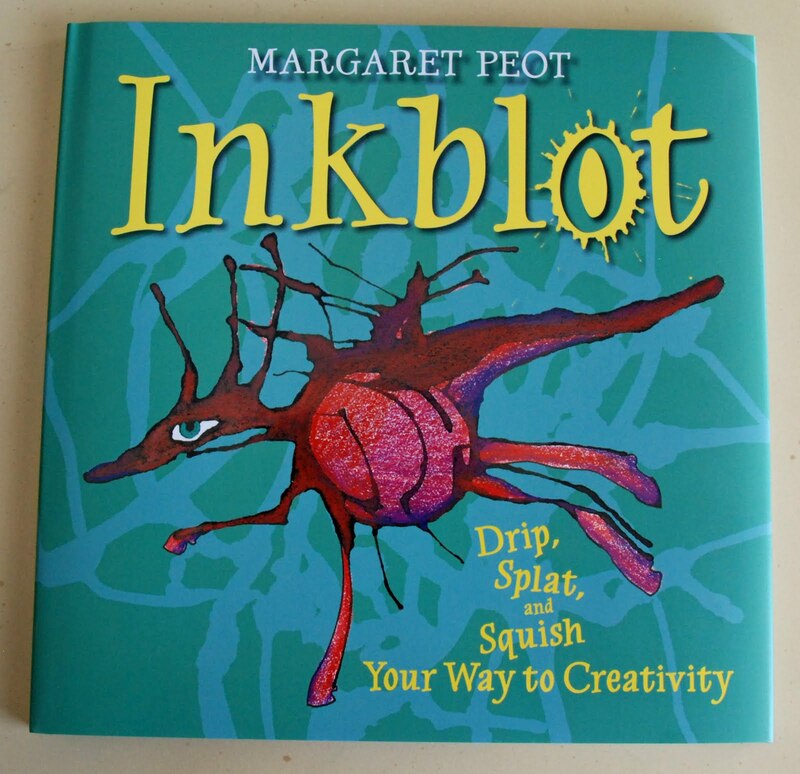 If you are interested in these blot ideas be sure to check out Margaret Peot's new book. You can visit theinkblotbook.com as well as her inkblot videos on youtube. Make sure to leave a comment before 9:00am Friday April 15th/2011 if you want to participate in the giveaway. Good luck everyone and make sure you try an inkblot! lots of potential in those inkblots. thanks for the lovely giveaway. the book sounds like fun! My daughter and I could have so much fun with this book! Thank you! We could use some creativity. Thank you for the giveaway! How fantastic! When I was little my best friend and I used to close our eyes and scribble, then turn it into something. This just looks like so much fun! Ooooh! Looks fabulous and inspiring...thanks for the heads up and for the giveaway! We made some folded heart Valentines this year using the paint blot method. It's amazing what kind of images emerge! That looks like so much fun! My kids (and I) would love it! Wow! I work with children's programming at a library and this appears to be a fantastic resource...very inspiring. I appreciate the opportunity for chance to win, thanks. It's amazing what you can find hidden in an inkblot. We'd love to add this book to our family library. Thanks for the chance! That looks like a great activity for my preschooler and me. Thanks for the chance to win, looks like a great book! ooh! Looks like fun! Count me in! I love your "messy table." WHERE WOMEN CREATE has team of stylists who prep the spaces for the photos shoots. I love the ink blot idea. And that would be a great idea for a journal-either kids or adult! I'll have to check out our school media center for her books. i love using inkblot lessons at the beginning of the year. i teach K-12 students with behavioral and emotional disabilities, and a lot of them struggle with self esteem and motivation in school. many of them are reluctant to try anything, because they are scared to "mess up". I do inkblots at the beginning of each school year to show them that accidental art can be beautiful!! many of them really get into this! I'm so glad you had a great vacation (I loved the photos you shared). I'd love to be entered into the giveaway - the book looks fascinating! Awesome! I'll be using this technique for my Daisy Scout troop. I'm sure that they will come up with wonderfully creative designs. This is such a great art idea for my daughter! Love the ones you made as well! Fab idea.. I actually saw two gymnasts in your original photo! I think I'll do a lesson like this this week... but would still love the book to further inspire me! Those are super cool inkblots. I love these ideas. Me, me, me!!! Pick me! PLEEEEASE!!! That's how most of my students would ask anyway. I would so love to win this to use for myself and my own kids as well as my art students. I'd love to have this for my kids (OK, and myself)! The book looks like very interesting, could use it...and your blog is very inspiring. LOVE this! We have done a lot of symmetry blotting in the classroom and the kids find it to be amazing but I had not added details so thanks for the extra tips! How fun! Love your dragon head. 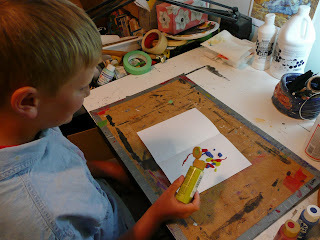 I will have to try the paint project with my 2-year old son; I'm sure he'd love to make his own monster! 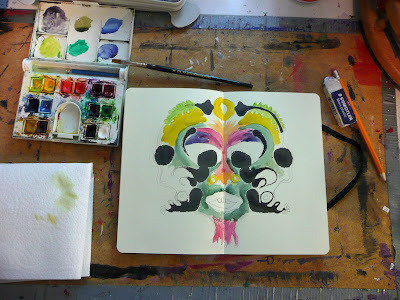 I love the blot monsters, and moreover I am relieved to see a lived-in workspace that is true to the creative life! Thank you for sharing these fun expressions. 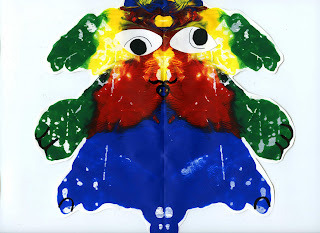 Have done inkblots for a color mixing exercise with my kinders and it is a hit! Would love the book for more ideas--thanks for the opportunity to try to be a winner! These ideas are so creative. I love that you can start with only a few drips and end up with something amazing. I'd love that book. I have this book on my wishlist. I like the idea of using it in my classroom. I think this is a great idea for kids or adults. I will certainly try it in my journal. Looks like a fascinating book! Thank you for the chance to win it. Your blog is inspiring! I love it! Hope to win! What a fun way to teach symmetry! What a fun looking book. Thanks for the chance to win. This looks like something my kids (and I) would really enjoy. Thanks for the inspiration of a fun project! Your ideas are always inspirational! If you love the book, I know my students and I will! Thanks for the chance to win! Thanks again for another creative yet simple idea. I have used many of your ideas/projects this year with my students to great reviews. I am a teacher in Calgary, and followed your entries during your trip to Hawaii with much jealousy as the snow and cold were relentless over Spring break. Thanks for the opportunity to win. This looks like a lovely book to add to my artbook collection. I"d love to win the book...thank you for the chance..
My students would love this book. I would love this book! Thanks for a great blog and a chance to win. Will definitely use this as a lesson in the future. Thank you for your inspirational posts Gail. Great giveaway, great ideas, lovely book! The book looks fabulous and your artwork is AMAZING!! As always!!! I'm thinking that this could be used for math lessons on symmetry as well. It's always great to combine visual arts with other teachables. The book looks amazing! I love your blog and have been inspired by so many of your ideas. I would love to use this book with my kinder class. Thanks for the chance to win. Thanks once again for some inspiration! Love the ink blot ideas! Very nice of you to do these giveaways! This is awesome. I do a "Magic Show" with Kindergarten with this concept to show secondar colors! I borrowed the idea from a friend. I can't wait to try this! Thanks for the chance to win this book and share the ideas with the kids in our art school! This is awesome! Hope I win! I've been reading your blog for quite some time now and I'm always inspired. You have wonderful ideas! Glad you had a wonderful vacation. A blank page or canvas seems to be very intimidating to most people. Using a inkblot as a starting point might alleviate some of that stress and make the process more fun! Thank you for sharing the idea! I love all the photos in your blog. Keep up the good work. Amazing....I'm using this project for my journal intramural today...thanks for the inspiration! You simply amaze me! rainbowartistally at gmail dot com. I love your blog! I am a special services teacher for students with moderate to severe disabilities aged 16-21. I teach an "exploring art" class and use lots of your ideas. thanks so much for all your hard work putting this together. How neat! I just love your blog. The un-artistic in me gets a boost from the artistic in you! Thank you for sharing all of your ideas and making them simple enough for me to share with my own children! brandyferrell at yahoo dot com. These type pieces are so pleasing to the eye and mind. 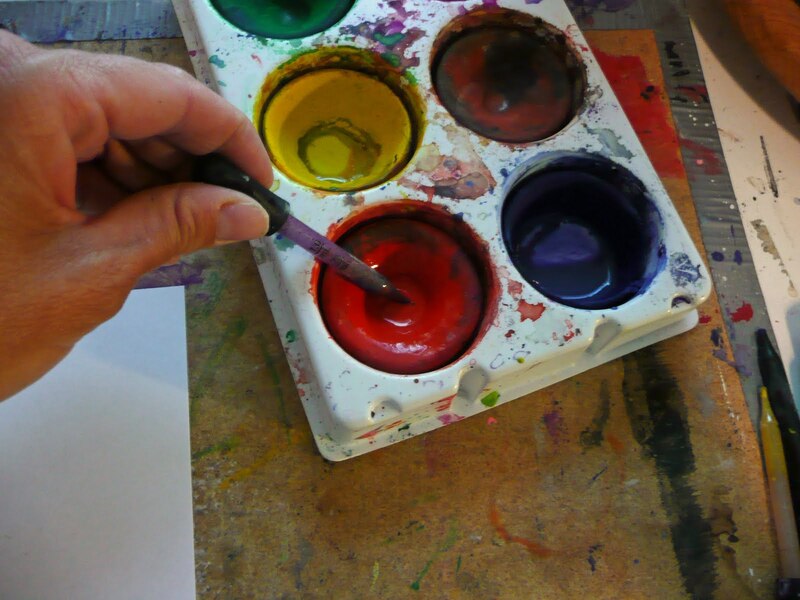 I am always looking for more teaching ideas and some for visual journaling. I really like this one! Thanks for sharing. Another great idea to add to my Color My World camp this summer! I just love your offerings! Please count me in to win the book. This is a great idea for my art group! This looks like a wonderful book. 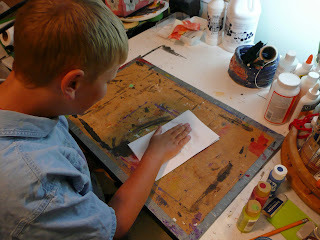 I love the folded ink blot exercise. As a teacher, this book looks terrific, I could use it in the classroom or with my kids at home. I have loved doing some of your projects with my class and the Girl Guide group my daughter is in. This Friday, we are attempting to do the Woven trees!! Excited! I am beyond thrilled to learn of this book and would love to win it! Glad you are back from your vacation! I loved seeing the pictures you would post. We are going to Maui for the first time in September and can't wait! 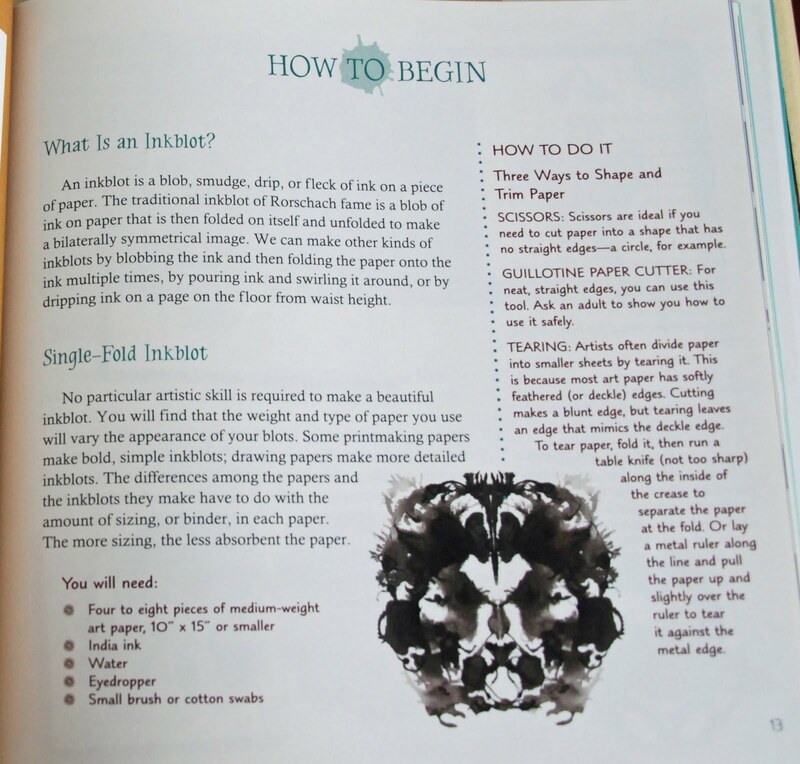 i think i will try the inkblot activity with my elementary AND college students! Looks like a great teaching tool! And would be great with my kiddos at home! Count me in! Thanks! Yeah! I did it. This is my first blog post! I have followed your page for a year, and have used many of your ideas in my classroom. This looks like just the book for me! Love the blog. These are wonderful!!! You are the best!!! your great ideas - very inspirational! 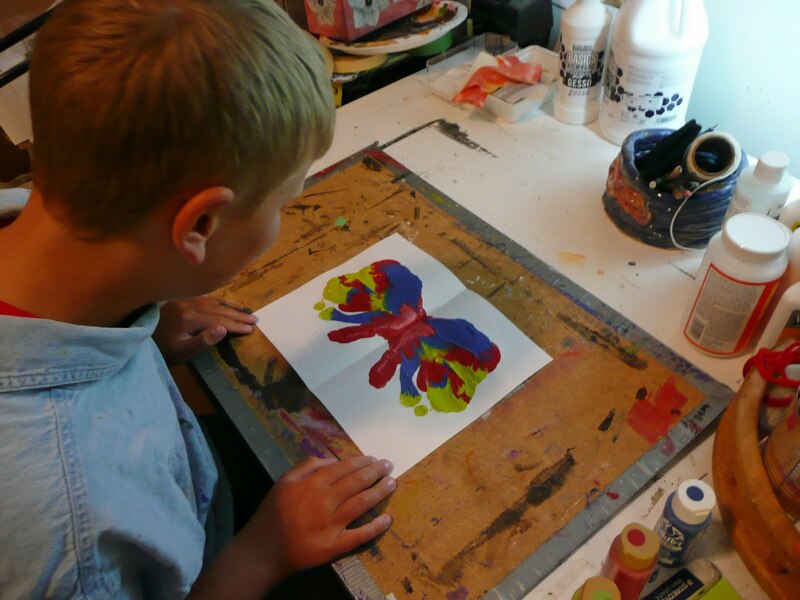 I love this approach so much more than the way I have been doing it with my preschool kids (which is basically putting a big blob of paint on a page and folding it) I like the idea of using the dropper which make it more controlled. AND like the idea of just putting it on one side. For whatever reason, I'd always just put the blob in the middle of the page. Thanks! The book looks cool! This sounds like so much fun. I'd love to plqy with this idea with my grandson! I love it! Looks really fun for small hands. thanks for the giveaway! 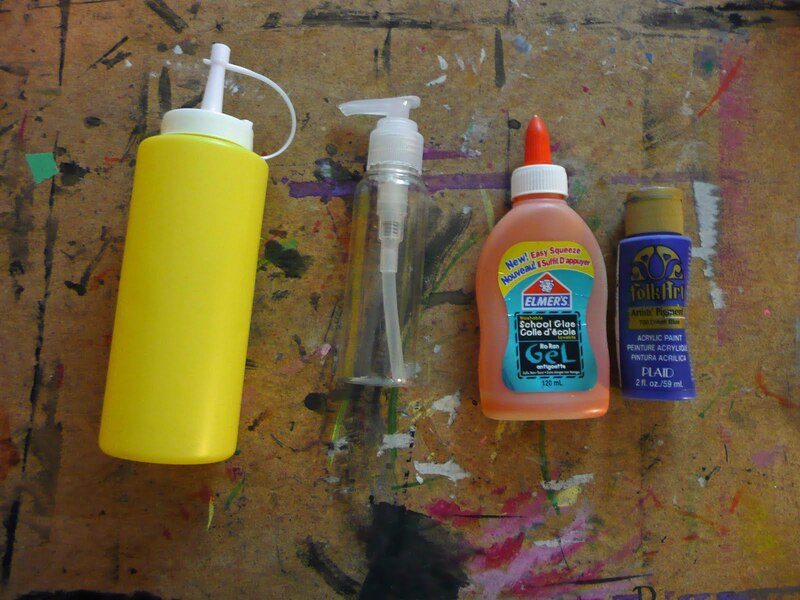 I love your blog-can I come and live at your house and make all these cool things with you? Thanks so much for all of the ideas and inspiration. My kids and I have used an inkblot approach to make beautiful butterflies. Thanks for offering the giveaway. The book would be fun for my kids and i! Your site is fantastic! I would love to win this book. 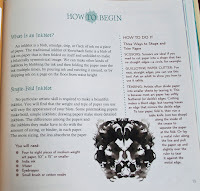 I think my 6 year-old niece and I would have a wonderful time exploring this book and creating our own inkblot fun! What a fascinating concept! I can only imagine the creativity-stretching that would come from this book. Thanks for the chance to win. I keep struggling to find an art lesson to do with my class but the ink blot idea looks fun and very creative. Thank you for the inspiration!! Looks like an awesome book, and one I would like to add to my library. O my goodness there are a lot of entries here! Just have to put my name in the hat for this book. I would so love playing with this and then passing it on to a couple cute little kiddos I love to play with! Thank you for the fabulous giveaway and for the heads up on the book. I love your blog Gail and I check it every day to see if there is a new one. I love your creativity and the teachers in our school love your ideas so many of them are used! Thanks for opening my eyes to the inkblot blog as well. Great ideas! I am always looking for new ideas for my sketchbook. This year I am having my students give me drawing suggestions and I am drawing one-a-day. It has been tedious but it is getting alot of my students excited about art! Thanks for all of the great ideas!! I have read your blog for ages. I think this may be my first comment. Would love to win the book! This book would be great inspiration for my students!